Cotton candy is as much fun to make as it is to eat! Rent a cotton candy machine for your next event for fun or fundraising. At your next big get-together, block party, birthday bash! Here's an easy way to making this sweet-tooth treat that will make you the hit of the party. We even supply you with a special low table to make it easier to operate the machine. We carry sugar floss and cones and bags as well. This cotton candy machine makes 4- 1 oz servings per minute and over 100 oz. of Cotton Candy per hour. Our cotton candy machine includes a safety double bubble that fits over the top of the bowl for safety and clean, efficient use. Additional Flossugar, Cones and Bags can be purchased from Magic With A Twist. Cleaning the Cotton Candy machine is EZ. All you have to do is place floss pan and double bubble into plastic bags and return it along with the machine and we clean the cotton candy machine at no charge to you. An adult must be in charge of the cotton candy machine at all times. The cotton candy machine requires a low counter or our low table that is sturdy and stable while in use. An electrical outlet needs to be available within 50' of the cotton candy machine. 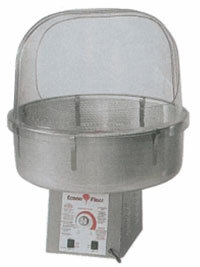 The Econo Floss Cotton Candy Machine has a standard 3-prong plug and requires a standard 110-volt, 15-amp plug. The machine is approximately 27"wide x 27"wide by 38" tall. To keep from damaging the heating element Gold Medal Flossugar is only mix to be used in our machines. Delivery is free with rental of moonwalks or magic show. Gold Medal Flossugar is a ready to use premix sugar for making cotton candy. Packed in sealed 3.5 lb. half-gallon milk carton type containers in the following flavors Blue Raspberry Strawberry Grape Lime Orange and Pina Colada. To increase your sales during your event change flavors every 10 to 20 servings. Each � gallon carton will make approximately 50 to 60 servings depending on serving size. Floss sugar flavors vary to on hand stock. These cones are the strongest cones available. Sold in counts of 50 & 100. These plastic bags are great to transport your sweet treat home. Bags also let you send one home with each child for their party favor. These 12� x 18� Red Clown design bags can also help double your cotton candy sales during a large event. Bags are sold in a pack of 100. Although it may look like a colorful magic wand, it�s magical candy that you can eat. The Candy wands start out as a clear tube but as the fun begins the children add their favorite assortment of colors and flavors to end up with a colorful magic wand. Once the tube is filled a colorful cap is added to complete the wand. The Candy Wands can be used in place of goody bags for a delicious handmade craft. Face painting is great way add a smile to a child�s face. The children pick out their favorite design and colors. Magic With A Twist�s Artist will paint the cheek or hand of children to squeals of delight. We use quality Make-up for our face paint, which washes off with soap and water every time! Each child will receive one painting and the birthday child gets two. Price is based on a party of 12 children. Extra children may be added at a nominal fee. Magic With A Twist�s Balloon Artist specializes in balloon party hats, which will give your party that extra festive look. Every child will get a balloon and the birthday child will get several balloons along with a special Balloon birthday hat. The balloons can be sculpted into just about anything from fierce swords to pink poodles. Price is based on a party of 12 children. Extra children may be added at a nominal fee. Make sure your guests know they�re at the right party with Magic With A Twist�s Inflatable Birthday Cake. The cake is an amazing 6-foot tall trimmed in blue and pink icing and topped off with candles and is internally lighted for those evening parties. The Birthday cake is also a wonderful indoor party decoration. Simply plug in your electrical cord and place the outlet were you would like the cake set up. Upon Magic With A Twist�s arrival the cake will be put into place for all your partygoers to see. For outdoor use we prefer to set the inflatable Birthday Cake on grass so it can be secured with stakes. This Green Guy Greeter is just the thing to make sure your party guests don�t pass you by. This inflatable is a 15-foot tall and dances from side to side. The Green Guy has a very friendly face with waving arm is sure to put a smile on your guests face as they arrive. Draw attention to your special event with the Green Guy Greeter. Our Bubble machines and Bubble Juice will help you create a festive party atmosphere with hundreds of bubbles floating around. The Bubble Machines can be used inside or out and feature a built-in fan, which blows the bubbles up and away! When you use bubbles watch the children�s smile grow as they run around trying to catch as many as they can. Our Bubble machines and Bubble Juice will help you create a festive party atmosphere with hundreds of bubbles floating around the room. This machine is not a toy but a professional bubble machine. Simply plug in your electrical cord and place the outlet were you would like the bubble machine set up. It is always best to place the bubble machine up and away from the little ones. When used indoors for any length of time hard floor will become slippery, so keep this in mind when looking for a location to set the bubble machine. 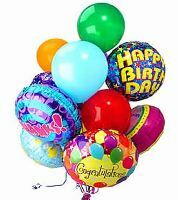 Helium balloons add color and life to your special event. For carnivals, open houses, school and church events, receptions, outdoor weddings, sports events, grand openings and more. Our tank will fill 75 11� latex balloons. An adult must be in charge of the helium tank at all times. Any pressurized gas is potentially hazardous. Helium is a non-flammable, colorless, odorless, tasteless, inert, non-toxic gas, but it is a hazard as an asphyxiant because it can deprive your lungs of oxygen. Rent our 10�x10�EZ Up tents, one of the most popular instant shelter. These tents are great for any outdoor event to keep the sun off. The EZ Up tent pack small but give you a lot of shade on those hot summer days, and will even keep the rain from spoiling the day. Beat the heat at your event with an evaporative cooling tent. The micro-fine misting nozzles cool the air temperature inside the 10' x 10' open-sided tent. Your guests can get cool without getting soaked, unless they want to. This environmentally friendly cooling system uses no electricity and very little water. No electric at your event location? No problem, with Magic With A Twist�s generator you�ll have plenty of power. Use the gas powered generator to inflatable any of Magic With A Twist�s inflatables. The Coleman 5000 watt gas powered generator has a control panel with four 120-volt outlets and one 120/240-volt twist lock outlet.